The book itself is very well designed, boasting a lovely old map on its cover and, as exacting as the Prime Meridian, the contents are laid out flawlessly. But what of divination? The subject matter within the book ranges from a fastidious mind at McDonalds to a sentimental poet akin to the great Emily Dickenson, to a cancer survivor, and more. 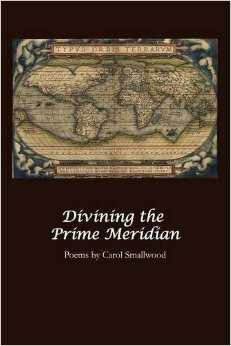 In this collection, Carol’s free verse and formal poems are equally skillful. She neither relies on form nor shies away from it, instead using whatever means she divines most appropriate. The poems are immediate and clear, if occasionally abstract. Throughout the book, there are moments when Carol reveals that beneath the surface of a caring, astute individual, there is a person who has overcome more than one trauma.